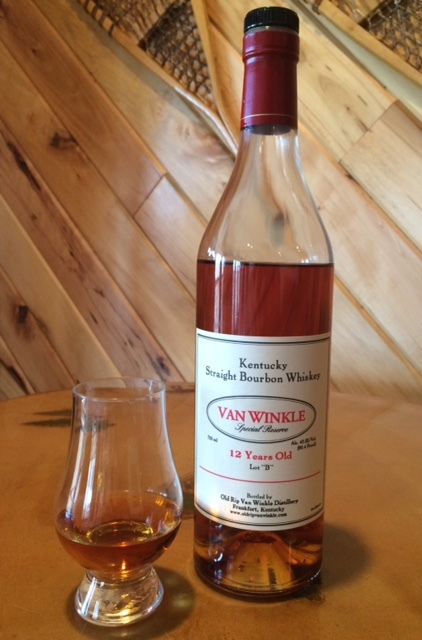 Van Winkle Special Reserve "Lot B"
Special Reserve " Lot B" is the 12 year old bourbon from the Van Winkle collection. These wheated bourbons boast a uniquely soft profile with rich, sweet flavors. Nose: A giant bowl of fresh fruit, with spiced peaches and dried mango. There are delicate notes of sweet wheat, caramel and vanilla spice. Taste: Silky smooth with a robust, sweet wheat on the tip of the palate. Peach cobbler, burnt caramel, and black pepper spice mingle gracefully for a delightful flavor. Finish: A smooth, quick finish, with a sweet spice and subtle oak. Conclusion: An overall wonderful experience. It's a bottle that is frightfully easy to finish with a some friends and good conversation. It's so smooth and the quick finish will keep you coming back for more. People have asked, "what is the most I would pay for such and such bottle"...and while it is an entirely subjective question, I would spend up to $100 on this one; it's that good! Sazerac Rye Whiskey is distilled and bottled by Buffalo Trace Distillery. Often referred to as "Baby Saz", it is another Buffalo Trace whiskey that is difficult to find. I have been wanting to review this for a while but have had trouble finding a bottle; it is an enjoyable pour but not something you should consider paying over MSRP for. Nose: An abundance of vanilla and spearmint are the first notes that float out of the glass. A thin layer of green tea follows, with canned corn, clove, and pepper. Taste: Candied spices and citrus fruit jump on the tip of the tongue. Mint transitions smoothly from the nose to the palate, and is joined by light notes of buttered toast, anise, and oak. Finish: Short and smooth with slight hints rye spice and a low lying licorice. Conclusion: The majority of this bottle was used in cocktails rather than drinking neat. It is an enjoyable pour however I was slightly disappointed with the overall complexity when I drank this neat for the first time. It doesn't deserve the hype that comes with being a Buffalo Trace product, but it's certainly worth a try if you can find it for under $40. 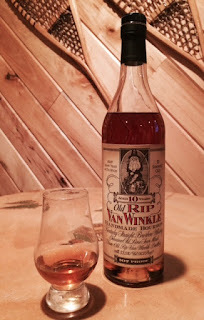 Old Rip Van Winkle (ORVW) is a 10 year bourbon from the Van Winkle collection. These wheated bourbons boast a uniquely soft profile with rich, sweet flavors. Unfortunately, the hype with anything Van Winkle related seems to grow year after year (exacerbated by a ridiculous secondary market value), making it very difficult to get your hands on. Buffalo Trace has recently started to combat this inflation by releasing press statements educating consumers on how to spot fake bottles floating around the secondary market, but for now, it's a storm we will all have to wait out. Nose: Waves of vanilla and brown sugar sit at the top of the glass. Notes of roasted pecans, sweet spice, and oak follow. Taste: Chewy with robust sweet wheat sitting on the tip of the tongue. Further sips reveal marshmellow, graham cracker, cherries, and tobacco. Finish: Mellow with sweet wheat, cherries, tobacco, and a peppery spice. Conclusion: ORVW is simply delicious. A perfect combination of age and proof, it has everything I want from a wheated bourbon. If you can snag this for close to MSRP, consider yourself lucky! It's great bourbon, but in no way is it worth paying a price of $200+.